This article is about the police department in Vancouver, British Columbia. For the police department in Vancouver, Washington, see Vancouver Police Department (Washington). The Vancouver Police Department (VPD) (French: Service de police de Vancouver) is the police force for the City of Vancouver in British Columbia, Canada. It is one of several police departments within the Metro Vancouver Area and is the second largest police force in the province after RCMP "E" Division. VPD was the first Canadian municipal police force to hire a female officer and the first to start a marine squad. VPD, along with eleven other BC municipal police forces, seconds officers to the Combined Forces Special Enforcement Unit – British Columbia. VPD now occupies the former Vancouver Organizing Committee for the 2010 Olympic and Paralympic Winter Games (VANOC) building at 3585 Graveley Street, which houses administrative and specialized investigation units. At the first meeting of Vancouver City Council, Vancouver's first police officer, Chief Constable John Stewart, was appointed on May 10, 1886. On June 14, 1886, the morning after the Great Fire of 1886, Mayor McLean appointed Jackson Abray, V.W. Haywood, and John McLaren as special constables. 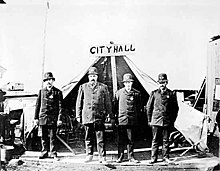 With uniforms from Seattle and badges fashioned from American coins, this four man team became Vancouver's first police department based out of the City Hall tent at the foot of Carrall Street. These four were replaced in 1887 by special constables sent by the provincial government in Victoria for not keeping the peace during the anti-Asian unrest of that year. The strength of the force increased from four to fourteen as a result. By 1904, the department had grown to 31 members and occupied a new police building at 200 Cordova Street. In 1912, Vancouver's first two women were taken on the force as matrons. With the amalgamation of Point Grey and South Vancouver with Vancouver in 1929, the department absorbed the two smaller police forces under the direction of Chief Constable W.J. Bingham, a former district supervisor with the Metropolitan Police in London. By the 1940s the department had grown to 570 members. In 1912, L.D. Harris and Minnie Miller were hired as the first two policewomen in Canada. In 1917, Chief Constable McLennan was killed in the line of duty in a shoot-out in Vancouver's East End. Responding to a call by a landlord attempting to evict a tenant, the police were met by gunfire. 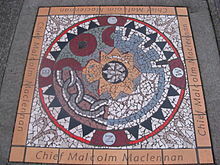 Along with McLennan, the shooter was killed in the battle, as was a nine-year-old boy in the vicinity at Georgia and Jackson streets, which is now marked by a mosaic memorial. A detective who lost an eye in the shootout, John Cameron, later became the chief constable of the New Westminster Police Department before taking the top job of the Vancouver force, which he occupied from 1933 to the end of 1934. Another member of the force was killed in the line of duty in 1922. Twenty-three-year-old constable, Robert McBeath, was shot by a man stopped for impaired driving. McBeath received the Victoria Cross for "most conspicuous bravery" at the Battle of Cambrai in France in the First World War. McBeath's killer, Fred Deal, was initially sentenced to death, but won an appeal reducing it to life in prison because he had been beaten while in custody. The marine squad's boat, the R.G. McBeath VC, was commissioned in 1995 and named in honour of McBeath. Plans for a new police building at 312 Main Street began in 1953. The Oakridge police station opened in 1961. In 1935, under Chief Constable W. W. Foster, the Vancouver Police Department was complemented with hundreds of special constables because of a waterfront strike led by communists, which culminated in the Battle of Ballantyne Pier, a riot that broke out when demonstrators attempted to march to the docks to confront strikebreakers. Also that year, nearly 2,000 unemployed men from the federal relief camps scattered throughout the province flocked to Vancouver to protest camp conditions. After two months of incessant demonstrations, the camp strikers left Vancouver and began the On-to-Ottawa Trek. The Vancouver Police were at the centre of one of the biggest scandals in the city's history in 1955. Feeling frustrated that blatant police corruption was being ignored by the local media, a reporter for the Vancouver Daily Province switched to a Toronto-based tabloid, Flash. He wrote a sensational article alleging corruption at the highest levels of the police department in Vancouver, specifically, that a pay-off system had been implemented whereby gambling operations that paid the police were left alone and those that did not were harassed. After the Flash article appeared in Vancouver, the allegations could no longer be ignored, and a Royal Commission, the Tupper Commission, was struck to hold a public inquiry. Chief Constable Walter Mulligan fled to the United States, another officer from the upper ranks committed suicide, and still another attempted suicide rather than face the inquiry. Other scandals and public inquiries plagued the force before and since this one, dubbed the "Mulligan Affair", but none were so dramatic. An earlier inquiry into corruption in 1928 was ambiguous in its conclusions as to the extent of the problem. The last major inquiry into policing in Vancouver focused largely on police accountability. Judge Wally Oppal (later provincial attorney general), submitted the results of his report in 1994 in a four volume package entitled Closing the Gap: Policing and the Community. In 2009, the RCMP "E" Division joined forces with VPD to operate the Integrated National Security Enforcement Team (INSET)—Vancouver, operating out of VPD facilities instead of the INSET-BC Surrey operation base. 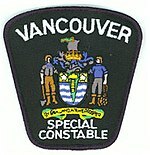 The Vancouver Police Union is a trade union that represents 1,450 front-line police officers, jail guards and special constables of the Vancouver Police Department. Community policing centres (CPCs), except the Granville Downtown and Kitsilano Fairview CPCs, are run by registered societies. The Granville Downtown CPC is under the direct control of the District 1 commander whereas Kitsilano Fairview is under the District 4 commander. Each CPC receives $108,200 annually from the VPD, with the exception of two non-society based CPCs which have a combined budget of $140,000. The budget is delivered in four quarterly payments and they can be used towards staff salaries, CPC programs, costs from electricity, renting office space, etc. CPCs are run by volunteers on a day-to-day basis with the supervision from paid staffs. Each year, the VPD audits all the CPCs and then reports to the city council on budgeting. Each CPC is assigned a neighbourhood police officer (NPO) who provides resources and guidance for the operation of the CPC. Sixteen members and eight Police Service Dogs (PSDs) have been killed in the line of duty since the department was formed in 1886. ^ Vancouver Police Department. 2015 Annual Report. Retrieved 13 March 2017. ^ a b "Organization - Vancouver Police Department". vancouver.ca. Retrieved July 23, 2018. ^ "History - Vancouver Police Department". vancouver.ca. Retrieved July 23, 2018. ^ "3585 GRAVELEY STREET fact sheet" (PDF). Retrieved July 23, 2018. ^ "Vancouver police leaving old headquarters". Retrieved July 23, 2018. ^ "Vancouver Police memorial". National Inventory of Canadian Military Memorials. National Defence Canada. April 16, 2008. Retrieved May 28, 2014. ^ Macdonald, Ian; Betty O'Keefe (1997). The Mulligan Affair: Top Cop on the Take. Vancouver: Heritage House. ISBN 1-895811-45-7. ^ Wally Oppal (1994). Closing the Gap: Policing and the Community. ^ Division, Government of Canada, RCMP, E. "RCMP in BC -". bc.rcmp.ca. Retrieved July 23, 2018. ^ "Chief Constable of the Vancouver Police Department". Retrieved July 23, 2018. ^ "Welcome to the Vancouver Police Union Website". Vancouver Police Union. Retrieved December 1, 2016. 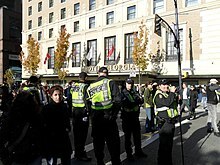 ^ "Community Policing - Vancouver Police Department". vancouver.ca. Retrieved July 23, 2018. ^ "2011 VPD Preliminary Operating Budget and Capital Submission" (PDF). Retrieved July 23, 2018. ^ "Community Policing Initiatives and Funding" (PDF). Retrieved July 23, 2018. ^ Speed Watch. ICBC. Retrieved on 2014-04-12. ^ Stolen Auto Recovery Program. ICBC. Retrieved on 2014-04-12. ^ "Bike & Pedal Car Roadeo - Collingwood Community Policing Centre". collingwoodcpc.com. Retrieved July 23, 2018. ^ ChildFindBC.com. ChildFindBC.com (October 4, 2011). Retrieved on 2014-04-12. 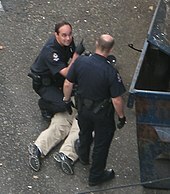 ^ "Organization - Vancouver Police Department". vancouver.ca. Retrieved July 23, 2018. ^ "History of Vancouver - Bluebird On Your Windowsill". vancouverhistory.ca. Retrieved July 23, 2018. ^ "In Memoriam | Vancouver Police Department". vancouver.ca. City of Vancouver. Retrieved July 5, 2018. ^ "Vancouver Police Department Canine Unit "In Memoriam"". Vancouver.ca. City of Vancouver. Retrieved July 5, 2018. "Vancouver Police Department – History"
Joe Swan, A Century of Service: The Vancouver Police 1886–1986. Vancouver: Vancouver Police Historical Society and Centennial Museum, 1986.